The contents are glued in an oversized cover and then cut clean on three sides. The cover is laminated as standard for a professional finish. This exclusive looking finish is sturdy and durable. The document needs to be at least 10 sheets (that is, 20 pages if the document is to be printed on both sides). 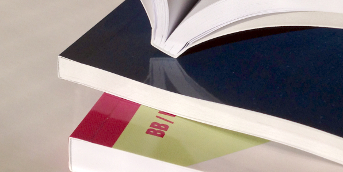 Your publication, (annual) report, educational material or thesis, bound as a real book. The cover is glued to the content. The cover is printed single or double-sided. Printing with bleed is not a problem here. 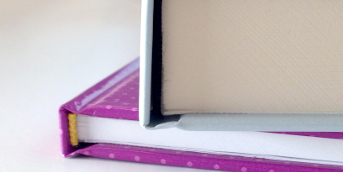 With a softcover book the cover is flexible, despite the sturdy paper. Various formats are available: from A4 and A5 portrait to A5 landscape. Or choose one of the other sizes: 170 x 240 mm (thesis) or 210 x 210 mm. The cover is always printed in colour, with 4 creases and standard gloss laminate. For the interior you can choose black and white or full-colour printing. Your edition bound as a real book with a hard cover. The cover is printed on one side only, however with this option, printing with bleed is no problem. If you opt for a hardcover book, the paper of the cover is glued onto thick cardboard, as a result, the cover is not flexible. Various sizes are available: from A4 and A5 portrait to A5 landscape. Or choose one of the other sizes: 170 x 240 mm (Thesis) or 210 x 210 mm. The cover is always printed in colour, and provided with a gloss laminate. For the interior you have the choice of black and white or full-colour printing. basic (EVA) or premium (PUR)? One binding method is not the same as the other. In terms of perfect bound there are two methods: PUR (Polyurethane) and Hotmelt (EVA). Both are thermoplastics, a technical word for hot glues. They are melted, applied and then solidify again. Look in our FAQ for more information as to which type of adhesive is most suitable for the different paper types. Deliver a separate file for the cover and spine. A glossy appearance? Choose 130g/m² matt coated paper for the interior. matt coated paper types can only be ordered in premium versions.